since 2011 i am writing a personal zine called MOMO. i already completed five issues. together with katrin i published 2014 15 3/4 stories, a compilation zine on self-love and self-care. you can order some of my zines via heavy mental distro. but you can also contact me, if you want copies. i also participated in several (maga)zines with my artwork and writing f.e. outside the box #4 arbeit, krass magazine #1 and dressed like that. feminine voices on sexism in the queer community and the queer/feministischer taschenkalender 2014 by riot skirts. as well i helped with some zines like resist normative images. how to organize a queer film festival. i am tabling with my project riotmade with love. 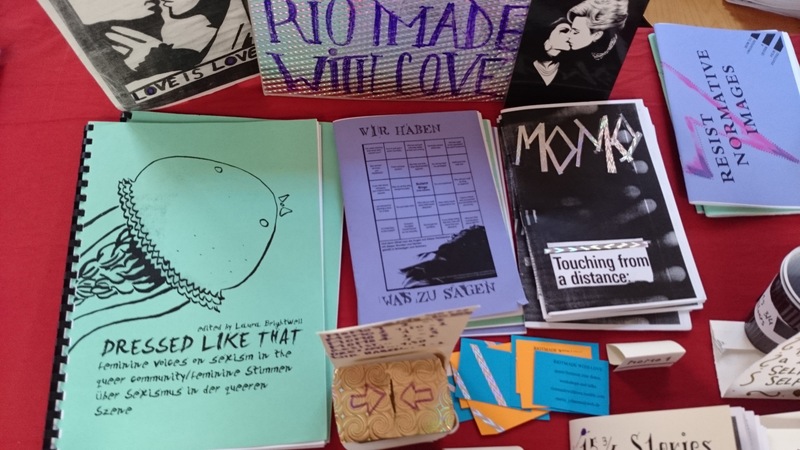 since 2012 i table at berlin zinefest (read my review from 2012 here) and 2012 and 2013 at london queer zinefest. 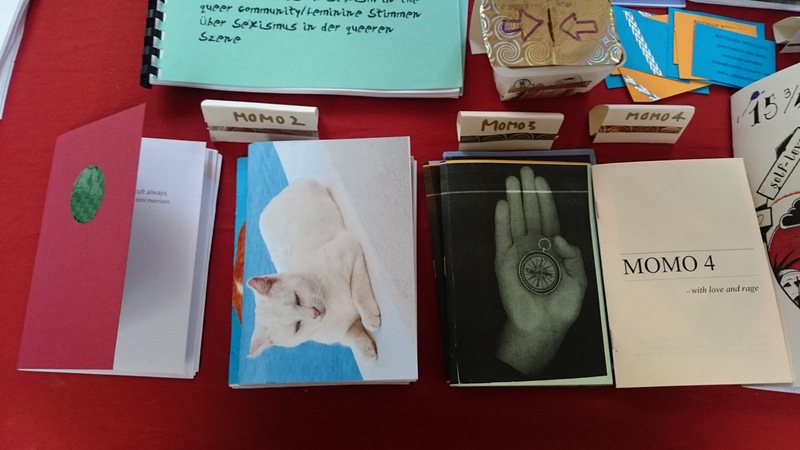 i also tabled at the queer zine fair in vilnius 2013. i was a coorganizer of the mini queer zinefest berlin. i also did academic research on identity-constructions in queer/feminist personal zines and gave various talks and workshops on queer/feminist zines f.e. at florida 13 (munich), monaliesa (leipzig), leipzig university and hildesheim university. 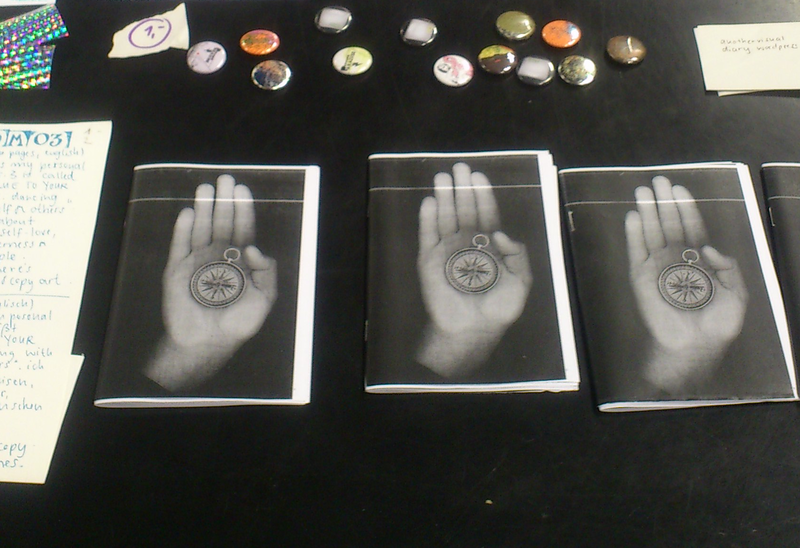 i do love to table, hold talks & workshops on queer/feminist zines and zine-writing/making! so do not hesitate to invite me : ) you can contact me via email maria _ johanna ÄTT web DOT de. p.s. i love to trade zines ❤ if you are interested drop me a message. it’s the first issue of my per:zine, momo 1 is full of pictures, collage and prose. it’s about the fading, gender, feminism, intersex, travelling, having a broken heart and contains a map of my inner universe. my friend alex contributed with a poster. momo 2: no love lost. momo 3 is about being a queer, loosing people you love, self-love and my love for books. it contains copy art by me reflecting how it feels to navigate space in between. momo 3 is a small and honest glimpse in my inner world. MOMO 4 is on creativity, encounters, queer politics, relationships and travelling. there are lot’s of essays, lyric and photographies. MOMO 5 = a visual love letter to leipzig, essay on trauma at the intersections of personal/political & queer present and past, collection of my art work for flyers, essay on beauty & photography, and a list if things that make me happy and give me strenght. MOMO 6 are travel diaries from a trip i did to san francisco, san diego and new york in autumn 2016. its full of personal reflections, (queer) historical background and lots of pictures. 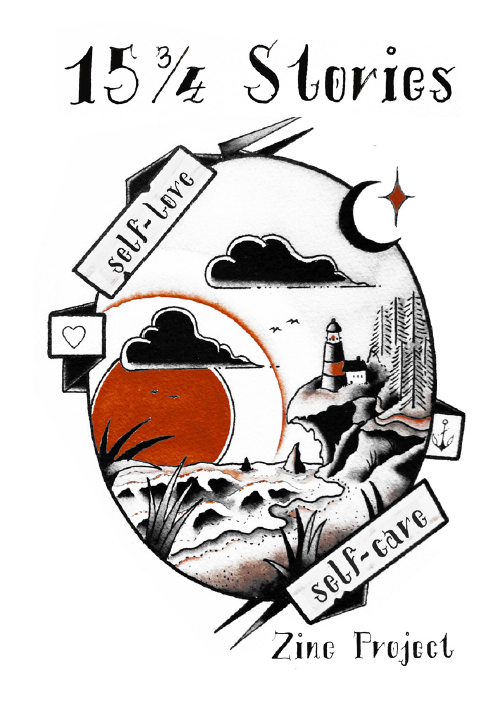 together with my friend katrin i edited the zine 15 3/4 stories on self-care and self-love. 15 3/4 stories shares mainly personal stories on self-love and self-care, most of them written with a queer/feminist perspective. topics are practices of self-care, caring queer/feminist communities, self-love and a room of one’s own, learning to live with oneself as a survior, learning to love oneself, dealing with (difficult) emotions, self-care for artists etc. beside texts you will also find beautiful paitings, illustrations and comics in the zine. in summer 2011 we organized a queer film festival in leipzig called paranoid paradise. in this zine we want to share the knowledge we got during long months of working to make it happen. we write about where to find films and how to make your choice which ones you want to screen, how to organize a plenum, how to get and audience and deal with different needs etc. as well as how we define queer. you can download the zine here & read an article about the production here. 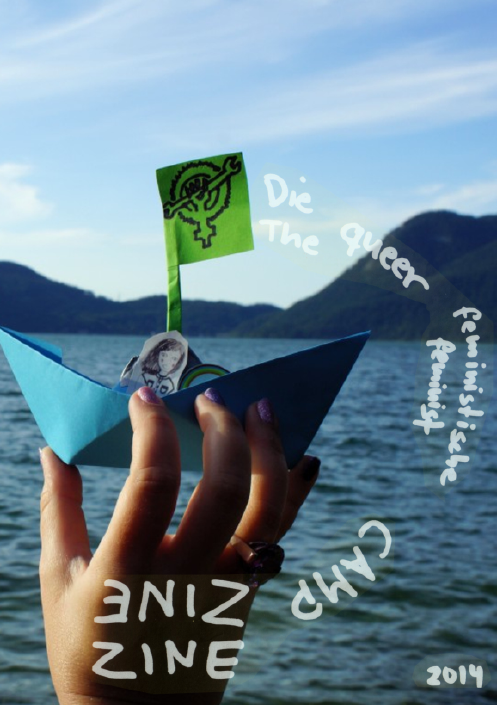 in summer 2014 the awesome queer/feminist summer camp took place at the walchensee in bavaria. meike, anna and me did a workshop on how to do a zine and installed a zine-crafting table! the results are stunning — so so many participate in this zine with drawings, comics, stories and illustrations!